Tornados, unfortunately, are part of life in Oklahoma and surrounding states, an area known by many as Tornado Alley. Here, cool Rocky Mountain air and warm Gulf Coast air tends to collide and form the supercell thunderstorms that often produce tornadoes. Spurred by disasters like the May 20, 2013 tornado that struck two elementary schools in Moore, Oklahoma, districts and municipalities throughout the region are adopting codes requiring all newly constructed schools to include safe rooms. FSB has designed safe rooms for decades. As technologies improve, the firm has placed heavy emphasis on bringing modern, practical options to its clients. 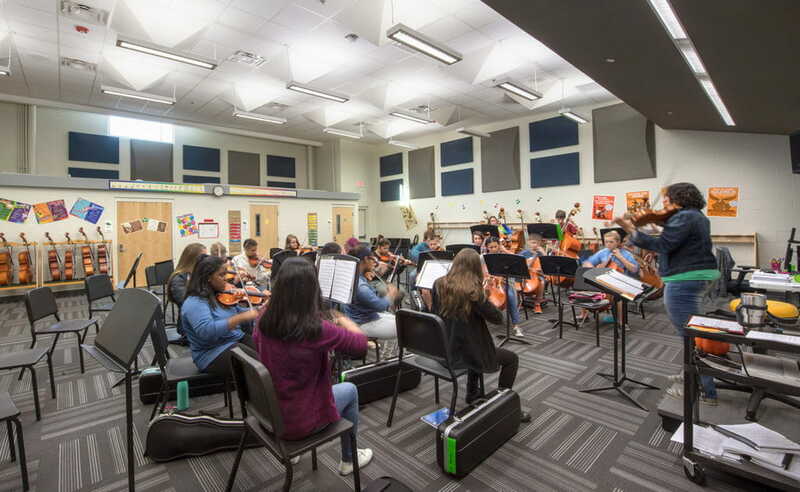 Instead, the architects and engineers of FSB are steering their education clients towards hardened spaces that can double as gymnasiums, band rooms, cafeterias, or proper classrooms with exterior windows. Contrary to common belief, aboveground shelters can be just as safe as below grade spaces if they are designed with the necessary structural reinforcements, Schmidt said. Schools have limited construction budgets and square footage, and most cannot afford to have a space that only functions as a safe room. More than ever, products on the market today make these multipurpose safe rooms attainable. Glover said that for Heartland Middle School, completed in 2016 for Edmond Public Schools, the firm incorporated high-performance laminated glass into the windows of one of the school’s safe room spaces — two adjoining classrooms. Approved for use within the past five years, the laminated glass looks like an ordinary window, but is an inch thick, made of glass layered between a thick laminate to prevent it from shattering into the classroom during a severe weather event. Set into steel frames, these windows are structurally welded into the supports with major columns and beams. The adjoining classrooms are one of two safe room spaces in the school; the other is a gymnasium. Together, they will accommodate everyone at Heartland. For another recent design project at Northern Oklahoma College in Tonkowa, FSB included safe rooms in its dormitory design. Each dorm building included a game room on the ground floor that could fit all residents during severe weather events — seven square feet per person, plus furniture. These safe room still had exterior windows, but designers also included steel shutters that could be fastened in the event of severe weather to shield occupants from broken glass. Beyond the obvious need for safe room elements to be designed by professional architects and engineers, materials must undergo a series of tests by the Federal Emergency Management Agency (FEMA) to be an approved building component. Safe rooms must withstand projectile debris as well as high wind forces, so prototypes of the high-performance glass, steel doors and steel shutters are repeatedly exposed to these forces in a testing environment before hitting the market. By FEMA’s definition, a safe room also includes emergency lighting, ventilation and a restroom. Schmidt said the firm works with school districts to learn the requirements and priorities of each school and design the shelter or safe room they need, with respect to FEMA guidelines. If the school has accepted federal dollars to fund the construction of a safe room, then FSB will also help the school submit plans to FEMA whenever needed for approvals. Though there is a finite amount of FEMA funding available for new safe rooms, Oklahoma schools have been strong grant recipients in recent years, Schmidt said. FSB stays up-to-date with changing local codes and federal requirements, and passes this knowledge on to clients. The firm’s understanding of new building materials and technologies informs safe room designs. As a cross-discipline firm, FSB’s team of architects, engineers and interior designers marries structural stability with aesthetics and functionality in safe rooms. Education Market Principal, Dennis Glover, AIA, NCARB, RID, LEED AP BD+C at education@fsb-ae.com or directly at 405.840.2931.